"So view, and get over it." And so begins the lighthearted attempt of Scary Clowns to relieve coulrophobes of their fear of "grotesquely made-up men wearing overly large trousers, huge shoes, and a red nose." This fear may seem as amusing as the characters that inspire it, but numerous support groups and hundreds of Web sites are dedicated to coulrophobia. 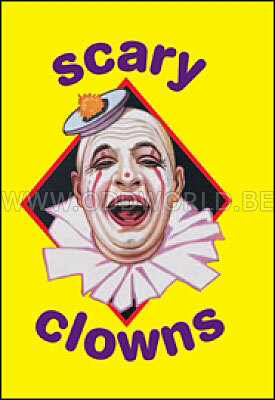 Horror movies featuring killer clowns, as well as notorious clown/serial killer John Wayne Gacy, have only fed the fear. Over 80 full-color photographs-from the surreal to the grotesque-populate Scary Clowns, bringing readers face to face with their worst nightmares. A pop-up clown in the middle of the book forces the reader to confront his darkest fear in 3-D. It is all done in the name of good, clean fun, of course. Why are seemingly innocuous clowns so horrifying to so many people? 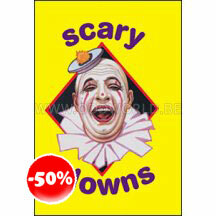 The introduction in Scary Clowns attempts to demystify the strange phobia. By nature silent, a clown makes no noise or complaint as he falls over, throws things, plays with knives, walks on high wires, tumbles, turns, and collapses. Maybe it's the silence that makes him so scary.